“It’s 5:52 AM. You have this whole day in front of you. I wonder if something bad is going to happen today?” Satan chides. I pull the covers up over my ears and try my best to ignore his evil sarcasm. These are lies. I know that, but they sting and they wound me. Tears well up in my eyes. “God I trust YOU. Please help me!!!! !” I am silently screaming in anguish. His presence is not immediate and obvious. It is a barely discernable whisper, but it is enough to put the strength back in my soul and to give me the power to get out of bed, placing one foot in front of the other. He further reveals Himself through a spontaneous hug from my sweet husband. My daily routine begins and it isn’t so bad as Satan tried to imply. I feel outwardly better, but traces of fear, sadness, uncertainty, and anger remain manifested beneath my unstable facade. As the sun purposefully migrates across the sky I sigh with relief. Satan’s malicious confabulation has gone silent, inaudible through the powerful wings of protection wrapped tightly around me. “You are part of something amazing,” God explains without words, “This is bigger, greater and more beautiful than you could ever, ever imagine. I give you glimpses of it from time to time, but someday I will show it to you in its entirety. Then this will all make sense. I chose you for this incredible, important task. I gave you your talent for writing long before you ever knew its purpose. The only thing that Satan is right about is that you cannot handle this on your own. Stay connected to me. I will give you strength, endurance, courage and protection. Lean on me, tap into my great power. Be reminded of my profound nearness in the air you breathe, the beauty of nature, the three birds, through the love of your family and the others I have placed in your life to be My hands and feet. Soak it in and accept it with gratitude. This evening we had a special delivery!! Such powerful words today…I think I can see God’s purpose in you! You encourage me with your faith and pray for you today and tomorrow and the next day! ‘Funny’ how the Jesus Calling devotional today was all about the enemy and his lies. I can’t tell you how much of this rings so true to me right now except it involves my 11 yr old and the painful things he is walking through right now. So much of which I can’t protect him from. So much confusion, doubt, and anger at why God let things turn out the way they have and I have to see my son’s heart repeatedly hurt because of it all. I also have no clue his to walk this road if full time caregiver for my Alzheimer’s ridden Mom and there’s a lot of confusion, hurt, and anger there as well. So I’ve been hiding out these past months, trying to walk this fine line of keeping just enough faith so as not to fall away for good but refusing to engage any more than I absolutely have because the disappointments keep coming and it just hurts too damn much. And I’m left wondering, where is this Father that’s supposed to be protecting us?? So I sit waiting for some miracle to fall down from heaven and fix it all. Especially my faith which used to be so strong but now feels like a flimsy sheet full of holes and barely holding on to the clothesline in the blowing wind, about to be ripped off by the next big gust which I know is right around the corner. I used to ‘know’ so much of this in my head and I thought, once in my heart too, and not so long ago. Sorry, didn’t mean to try and make it all about me lol. Just saying, I understand. I understand what it feels like to have your heart so torn apart and exposed and wanting to cling onto your child with everything you have and never let go. She is so crazy precious Aleisa and I would want to hold on with all my might and every ounce of strength too. But you are right, it’s not all only about here. It’s about the beauty He’s preparing us for and our forever home where all of this one day will be thought of as “light and momentary troubles”. Seems impossible at the moment but one day standing in the light of His glory and finally seeing how He indeed did really work it all together for good, we will rejoice. Take my heart oh take and seal it, seal it for Thy courts above. Nothing is impossible with God. Luke 1:37 Fear is Satan’s tool. He took away everything Job had and more. And yet Job never cursed God. God used Job to prove to us that no mater what happens to us or our loved ones he is always HERE. Mary and Elizabeth were given the impossible tasks of bearing and raising the Son of God and the prophet who would proclaim Jesus as Lord. He provides us with more than we need, or could want. He gives us the ability to preserver through what we look at as being impossible, and makes it possible through belief in Him. A year ago our little girl was born. What seemed to be a happy healthy baby, became a baby who was sick and dying. A parents worst nightmare. While in the midst of what seemed an impossibility, God was working in the lives of people around the world. I may never know the changes He made their lives. But I know how He changed me. I know he prepared me for this task of caring for a medically fragile child, by placing people in my life doing just that. I know he gave me the mothers instinct to know that something was wrong and the ability to deal with it in a calm manner. I know that I no longer worry about the little stuff and can move past the messy house and the un-mowed lawn and be just fine. He has given me the strength to work through the anxiety of “what if”, to the faith of “He will take care of this and more”. Aleisa He has given you all of this too. You may never know how many lives you have touched. Your transparency and Nora are a blessing to us all. Thank you for sharing you journey with us. ALEISA, I AM SO SORRY YOU HAVE BEEN HAVING TO FIGHT WITH SATAN. IT SEEMS LIKE WHEN THINGS GO A LITTLE WRONG, SATAN SEES AN OPEN DOOR, AND IN HE COMES. BUT YOUR AND WILLIAM’S FAITH IS TOO MUCH FOR SATAN, SO HE HAS TO BACK OFF. HONEY, RIGHT NOW ALL I CAN SAY IS GOD IS ALWAYS WALKING BESIDE YOU, AND WHEN THOSE FOOTSTEPS ARE NOT THERE, HE IS CARRYING YOU AND YOUR FAMILY. GOD IS SO MUCH STRONGER THAN SATAN, AND HE WILL NOT LET SATAN HURT HIS CHILDREN. I KNOW THAT MY SON (OUR BABY) IS 42 YEARS OLD, BUT HE HAS HAD HEALTH PROBLEMS ALL HIS LIFE, AND TODAY WAS A BAD DAY FOR HIM, AND I HAD A MELT DOWN. HE AND MY HUSBAND REASSURED ME THAT I AM DOING ALL I CAN DO. AS PARENTS WE ARE ALWAYS QUESTIONING OURSELVES IF WE ARE DOING THE RIGHT THING, BUT IN THE END WE HAVE TO PUT IT IN GOD’S HANDS. NO MATTER HOW OLD OUR CHILDREN ARE, THEY ARE STILL OUR BABIES, THEY ARE PART OF US. I PRAY THAT YOU ENJOY EVERY DAY THAT YOU HAVE WITH LITTLE NORA, BECAUSE WE DO NOT KNOW SHE COULD BE WITH YOU AND YOUR BEAUTIFUL FAMILY FOR YEARS AND YEARS, AND I AM PRAYING THAT IS THE CASE. THAT PICTURE OF YOU AND YOUR THREE CHILDREN LAYING ON THE COUCH IS PRICELESS!!!! I LOVE IT. THE PICTURE OF THE THREE KIDS TOGETHER IS SOOOOO GOOD. I AM GLAD YOUR TREE WAS DELIVERED TODAY, THAT I AM SURE BRIGHTENED UP YOUR DAY. IT IS GORGEOUS. I CANNOT WAIT TO SEE IT DECORATED, I CAN’T IMAGINE HOW PRETTY IT IS GOING TO BE. GOD WORKS IN MYSTERIOUS WAYS. HE KNEW YOU NEEDED A LITTLE LIFT TODAY, SO HE PICKED TODAY TO DELIVER NORA’S FIRST (OF MANY) CHRISTMAS TREES. 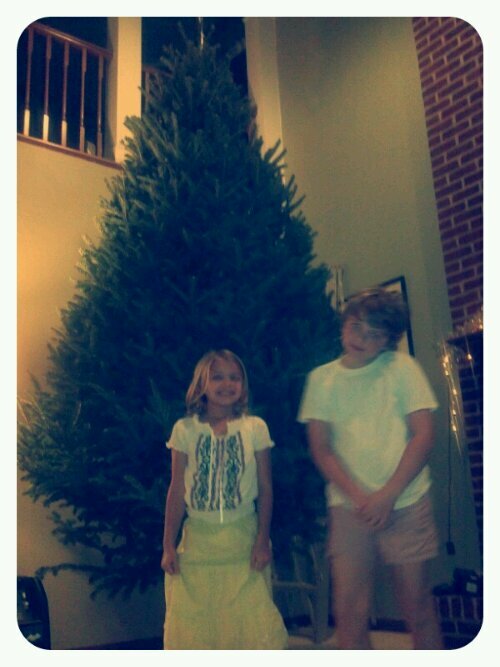 GAVIN AND GRETA SURE LOOKS EXCITED IN THAT PICTURE, AND LOOKS VERY TINY!!!! 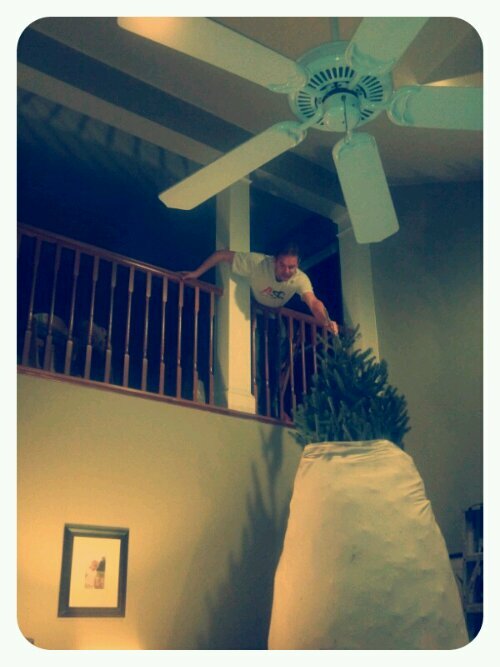 GOOD LUCK AND ENJOY DECORATING THE TREE. TRY TO GET A GOOD NIGHT’S SLEEP. GOOD NIGHT AND GOD BLESS. 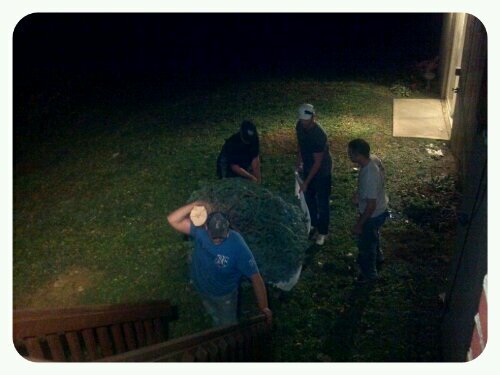 OMG, the tree is HUGE !!!!. Hmmm, I’m wondering if it can be replanted in your garden after Christmas….Looking forward to seeing the decor !!. The pics are wonderful as always !!. Aleisa, I’ve got a few scattered thoughts that are rushing me. 2000 thousand years ago a mother was fleeing for her son’s life, left her country, heck the whole Roman Empire and went to Egypt for her little love’s safety. Many years later she did have her mother’s heart pierced with a sword as she watched her son die. Horrific, horrific as it was we learn that Satan’s “victories” are passing. As Christians we know that Jesus suffered and died to give meaning to our suffering and to death. That is part of his ultimate victory, He redeems suffering. Still it hurts, even though an inescapable part is that cross we take up daily to follow him. (And when our own crosses are light we ought to act like Simon of Cyrene and help another person with theirs). Since we all have crosses, we all pretty much respond like the two thieves on their crosses next to Jesus, one cursing the Lord, the other getting an amazing promise of paradise! Oh, and when you see an innocent with a cross, you’re seeing the face of the man on the cross between the two thieves. 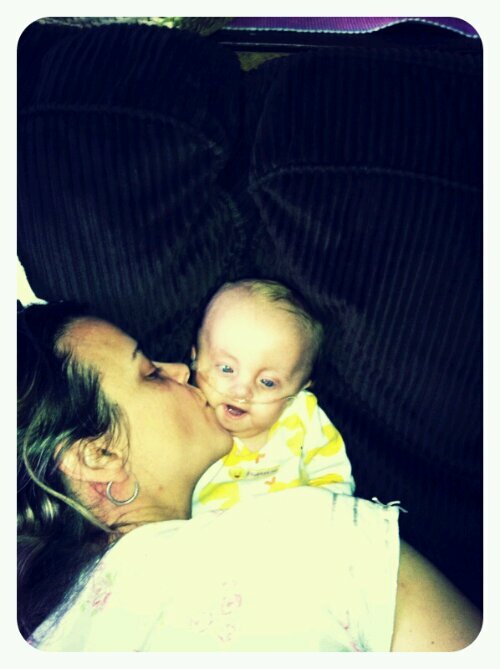 Kisses to your little love! My heart hurts for you and my thoughts have been with you very much. I have experienced fear also and it is so difficult sometimes to step over it or kick it aside when it hits. But as I read your blog each day – I see strength and God speaking through you. You may not feel it just now but others do. I love the pictures you posted today and especially the preparations for the tree. I can just imagine how big little Nora’s eyes will be as she looks over all the lights and trimmings. My blessins and prayers are with you and your family this Christmas season as we celebrate the birth of our Lord Jesus Christ. Praise Him. Like Ruth, I was likening you to Mary as I read your post. It’s so incredibly difficult to silence the feelings of fear and to replace them with trust and calm. But take heart, your faith IS strong. And Satan just tried to take a shot at you b/c of the “answers” you were receiving from God, just a couple of days ago. Don’t let evil cause you to doubt your faith and what you know is good and right. Love to your family and to you! Such beautiful words and so beautifully written. It is only by God’s strength can we live each day for His Amazing Glory!! Satan wants to kill, steal, and destroy. But greater is He who is in us than he who is in the world. I see HIm working in and through you. Keep trusting and listening to God and His Mighty Word. You are His vessel to be used of Him. Thank you for sharing your heart!! I am praying for Nora and your entire family. I meant to reply last night but was too tired. My daughter is special needs also. My own miracle and a very long story. She was adopted at 4 weeks of age. We were told that she would not survive and if she did she would never know anything. I can remember those early days when I literally slept an hr a night if I was lucky. 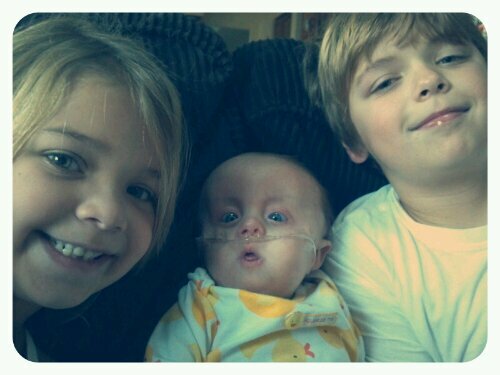 Kinsley had a trach so she could not be left alone because I could not hear if she cried. She made no sound because of the trach. I tied bells to her wrist so that I would know when she moved if I was sleeping. I was exhausted! I asked myself what had I gotten myself into. If I mentioned that I was tired or had a day when I needed a good cry, some relatives would say “you knew what you were getting and you have no right to complain”. I had no idea what the future held for her or us. But I knew that all I could do was to love her the best way I knew how for however long she had. The same as I do with my older sons. She is 18 now. And her life is far from perfect. She no longer has a trach. Her 18 yrs have been filled with dr apts, surgeries and studies. But she has taught me about the important things in life. Family. Friends. Patience. Trust. Not only in God but in myselfas well. I knew when something wasn’t right with her and had to learn to speak up and be her advocate. (I won’t print what I said to the above mentioned dr.). But doubts often crept in. I had days when I thought I was in over my head. Days when I honestly thought how much simpler life would have been if we had chose not to take her. Or if she just passed away. ( I know that sounds bad!) but every day I had to watch her suffer. I wondered how much a child had to go through. It was simply not fair. But the next morning things were always different. She wasnt fussy. Or blue or cold. I was rested. And when she would look at me and smile I knew why I had been chosen. It was to bless my life. Not hers. I have no idea what my point is and I know this is long. But we are only human. We have some of the same thoughts when our normal children were small and we were exhausted. We are not invinceable. But thanks to your blog you are never alone. You are an inspiration to other moms. You teach them that they are human. And bad days happen. But the good moments make it all worth it. But the reality of caring for a special needs child is that it is truly the hardest job we will ever do. But also the most rewarding. Thanks for showing us out here that we are not alone either. Thank you for putting into words again so much of my daily struggles for the past 4 years. The devil keeps trying to get me to believe I can not do my life and that it is too hard. I have 4 children, one has Down Syndrome and one has an intensely difficult, ongoing medical problem right now. I love your pictures! Aleisa, you are so beautiful and strong. I am on the verge of tears from this post. You inspire me with your honesty. Those fears can creep up so strongly that it is sometimes hard to realize that it is Satan himself tapping into our weakness. You have been blessed with such an amazing and inspiring baby girl who is proof of God’s love. God bless!!! Excellent post! I was able to use what you wrote and use it as *food for thought* for a situation of mine that I am in. Satan is real and he does tempt us. BTW that 1st picture is the BEST! Love that down shot from the balcony! Wish I would have utilized that. Genius. i need to learn to talk back to those voices, to have these conversations-pull the covers back over my head. you inspire me each and every day. thank you for all your sweetness and sharing your life with us all. Hello Aleisa, you don’t know me, but I was introduced to you through the photography of your birth story earlier this year, close to the time you actually gave birth. I was very encouraged by your story–not because of the typical “happy ever after” ending, but because I saw God’s hand print all over it–the Author and the Finisher of our faith. Every now and then I wonder “How is little Nora doing?” And “How is her mommy doing?” As a result, I google search to find you again to check in on how God is meeting you daily on your journey. As I read your “Conversations” post I felt compelled to reply. It is apparent that you know the tactics of the enemy and by God’s grace, have been able to battle the lies he throws at you, but I wanted to add to your defenses and stand with you as a fellow soldier. I just wanted you to know that a part of the “Bigger Story” are people like me who are being spurred on to greater works, and deeper faith–people who you may never meet, and apart from your story, would not have seen “this” glimpse of His wonderful, spectacular Glory. I am a mother of 4 ages 14 to 21, and though none are physically challenged, the same tactics are used by Satan to attempt swaying my thoughts against God and encouraging unbelief. Grateful am I to say that I hear the same sweet comforting voice of our Lord and Savior fortifying my faith and giving me strength to put one foot in front of the other to face the joys and perhaps, sorrows of the day. Though painful and confusing, He’s in this– and He’s got you, and He’s got Nora, and your entire family in the palm of His hand. “He works all things for good for those who love Him and are the called according to His (glorious) purpose.” I may never meet you on this side of eternity, but I believe I will recognize you on the other side, as the jewels in your crown will be amongst the brightest. Thank you for sharing so intimately. Have a wonderful holiday as you celebrate the precious gift given to us through the coming of our Lord and King, Jesus Christ our Savior. May God continually bless you and your sweet family.